A former Blaine County man admitted in court Thursday that he was "super crazed" when he broke into a home in the Gimlet area after earlier battering his girlfriend. "I was drunk and super-crazed and caused serious damage to their home," said 35-year-old Kent Joseph Muer in pleading guilty to a felony charge of malicious injury to property. "I am an addict, but I'm not a user now," Muer told 5th District Judge Robert J. Elgee during questioning from the bench. Muer, who now lives in Michigan, admitted to three other crimes at a change-of-plea hearing. He also pleaded guilty to felony possession of marijuana, misdemeanor domestic battery and misdemeanor DUI. In exchange for the guilty pleas, the Blaine County Prosecuting Attorney's Office agreed to have four other criminal charges dismissed, including a felony count of grand theft, a second misdemeanor count of DUI and misdemeanor counts of unlawful entry and operating a vehicle without the owner's consent. Thursday's court hearing concerned four different criminal cases filed against Muer in Blaine County in 2011. The first case arose on Jan. 11 when he was arrested by Hailey police on charges of felony possession of marijuana and misdemeanor DUI. The other three cases arose in early August when Muer allegedly went on a two-day crime spree in the Gimlet area south of Ketchum. In one case, he was charged with felony attempted strangulation, a charge reduced to misdemeanor domestic battery, for a fight with his former girlfriend on the evening of Aug. 4 at a home where the couple was staying. 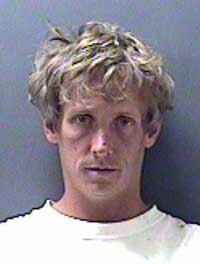 In a second case, Muer later that evening allegedly broke into two residences in the area, stealing items from one and taking a John Deere Gator utility vehicle from the other. Those alleged actions led to the charges of grand theft, taking a vehicle without the owner's permission, unlawful entry and malicious injury to property. All but the malicious injury charge were dismissed as part of the plea agreement. In the final case, Muer was charged with misdemeanor DUI for allegedly driving the Gator in the Gimlet area while drunk. That charge too was dismissed as part of the agreement. Deputy Prosecuting Attorney Matt Fredback told the court that he will recommend at sentencing that Muer spend up to a year in the county jail or be sentenced to a 90-day alcohol rehabilitation program administered by the Idaho Department of Correction. Further, Fredback said, he will recommend that Muer be placed on probation for four years, lose his driver's license, pay a $5,000 fine and provide 100 hours of community service.